Welcome to week ONE HUNDRED and nine of Saturday Centus. This was a picture of a little girl in Mo, our Grandlittle's, kindergarten graduation class. So NOW what you do have to say? Mwahahahahahahahahaha! Use the picture above as inspiration for your story. You are the sneaky one! I thought for sure this was a "woman" walking somewhere! I will think on this for a while and get back to you with a story! Beautiful photo but I have no words. Hello from a newbie Saturday Centus participant. Thanks for hosting. Yep, I knew she was a Foxette and not a Fox. In fact, I even thought it might be one of your granddaughters or a friend of theirs! I had a feeling it was a child. I even thought about doing a kindergartner but thought no, couldn't be LOL. Oh well, I still stuck with my 6th grader, ha. I really shouldn't maybe, but seriously! What is/was the Mommy thinking!!!! I don't know, my little princess Lyra going to be 3 is really in for these dressing up affairs and wearing mommy's shoes, but never ever outside the house! I say root for their young and happy days of childhood...please! Okay that said, sorry to hurt anyone's feeling...but I'm just all for staying and enjoying childhood, and as far as adult-hood goes...it really truly can wait and wait! Now I have to clear my head before I can respond to this photo! LOL. Aw, Mrs. Jenny. You're so tricky sometimes. I'm not feeling very creative today, as I've been doing battle with weeds...big battle with big weeds. Alas, they've invaded my blog too! 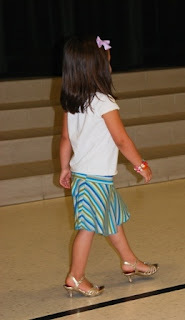 Heels in Kindergarten? No wonder the shoes looked like they were too big in last week's picture...what parent would buy those for a child? Let's see what I can do with a little more info. now. Hmmm?? ?